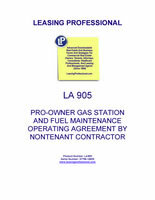 This document gives an independent contractor the right to operate a gas station facility owned by a gas station retailer. The contractor occupies and runs the station under a license agreement, rather than a lease. The contractor is compensated by receiving a "cents per gallon" commission calculated upon fuel actually sold at the location, and may also receive cash bonuses relating to maintaining certain hours of operation, appearance standards, and customer greeting practices. The contractor must comply with refiner rules and policies and other operating requirements specified in the form. This document is very pro-owner in orientation. THIS CONTRACT ("Contract") is made and entered into by and between_____________________, a ______________ corporation, hereinafter referred to as "Retailer", and ________________________, a _________, hereinafter referred to as "Contractor" and pertains to a certain retail motor fuel service station business owned by Retailer as provided herein. Retailer and Contractor are sometimes collectively referred to herein as the "Parties". ARTICLE 1. LOCATION: By the terms of this Contract, Contractor agrees to operate a retail motor fuel service station business owned by Retailer and located at: ___________________________________________________ ("Property" or "Location"). ARTICLE 2. TERM: The term of this Contract shall commence on ____________________ and end on ____________________. This Contract shall automatically terminate at the end of the term. The term of this Contract shall not be extended or renewed unless the Parties mutually agree in writing, thirty (30) days prior to the expiration hereof, to the extension or the renewal of this Contract. (iii) Contractor's loss of the right to occupy the Property to which this Contract pertains. ARTICLE 3. SERVICES OF CONTRACTOR: Contractor agrees to operate and manage a retail service station for the Retailer at the Location according to the terms of this Contract. Contractor's operation of the Retailer's motor fuel sales business shall include the responsibility for all facets of the day to day operation of such business, including dispensing Retailer's fuel to the motoring public and collecting monies therefor on Retailer's behalf. All monies collected on Retailer's behalf shall be the sole and exclusive property of Retailer, and Contractor shall collect such monies solely in the limited capacity of collection agent. Contractor acknowledges that this Contract creates no tenancy interest, leasehold estate or other real property interest in Contractor's favor with respect to the Property which Contractor may operate as provided herein, and provides solely a license to the Contractor to occupy and use the Property as specified herein. Contractor may operate or occupy facilities other than the retail service station referred to herein ("Other Facilities") located on the property, including without limitation, a convenience store, a car wash, mechanical service bays, provided that Contractor's occupancy and operation of such Other Facilities shall be pursuant to and subject to a separate Lease to be executed by and between Retailer, as landlord, and Contractor, as tenant. (a) PRICE: Retailer shall, in its sole discretion, determine the price charged retail customers and therefore the retail price collected by Contractor on Retailer's behalf for all retail motor fuel sales made at the Location. (b) PAYMENT METHODS: Retailer, shall, in its sole discretion, determine the means by which retail customers will be allowed to pay for fuel purchases, which means may include cash, credit cards, or ATM cards. Retailer will not allow customers to pay by personal check, and will cooperate with Contractor with regard to determining which payment means are practical at the Location. (c) SUPPLY QUANTITIES AND BRAND: Retailer shall, in its sole discretion, determine the amount and brand of motor fuel supplied to the Location, and may limit such amounts in times of shortages or unusual market conditions. Contractor shall abide by Retailer's quantity and brand decisions, and shall refrain from any activity which would in any way jeopardize Retailer's right to supply, price, or brand the motor fuel sold at the Location. (d) PETROLEUM REFINER POLICIES: Contractor recognizes that Retailer may be subject to various policies, rules, and regulations promulgated by Petroleum Refiners, and agrees to comply with all such policies, rules, and regulations. 1. Daily cash deposits to Retailer's ___________ Bank account to be made by 11:00 am of all gas monies including gasoline commissions. Whenever possible, gas monies including gasoline commissions will be transferred via EFT on a daily basis. 2. All rents and commissions will also be electronically transferred as either a credit or debit by the 5th of each month, after dealer notification. Retailer reserves the right to change this method of payment or the banking institution which Retailer uses. Retailer may expand or reduce these hours and days as required by market conditions. (g) RECORD KEEPING: Contractor agrees to keep all records and bookkeeping accounts and to perform all test and measurements designed by or specified by Retailer. Contractor shall be liable for any damage caused to Retailer by any errors in the records, bookkeeping accounts, measurements, or tests performed by Contractor. Contractor shall supply the records, bookkeeping accounts, test results and measurements to Retailer, without notice or demand. Retailer further reserves the right to audit the meters at any given time and bring the Location current on its gas payments, whether or not the station has closed out its internal bookkeeping day. This audit can be performed with or without notice.